IMS Company - Bluing Remover, 4 oz, (125 ml) Bottle Removes the Most Persistent Burns and Bluing Discoloration from Welding Seams. Also Will Clean Natural Bluing Which Can Occur from Thermal Mold Cycling. 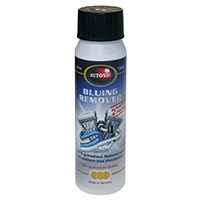 Bluing Remover, 4 oz, (125 ml) Bottle Removes the Most Persistent Burns and Bluing Discoloration from Welding Seams. Also Will Clean Natural Bluing Which Can Occur from Thermal Mold Cycling.